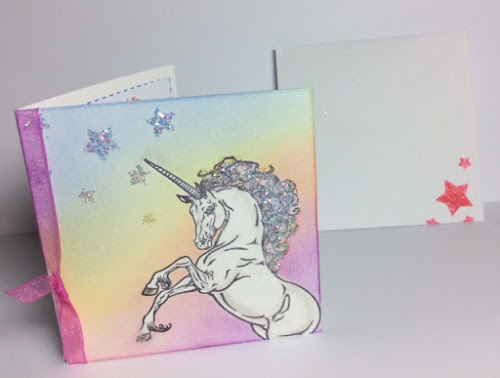 Hello and welcome to my Unicorn Party! 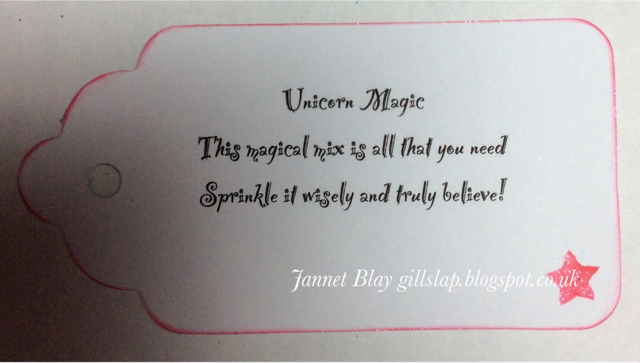 We all know that Unicorns are real, so of course they deserve to attend all of the special parties. 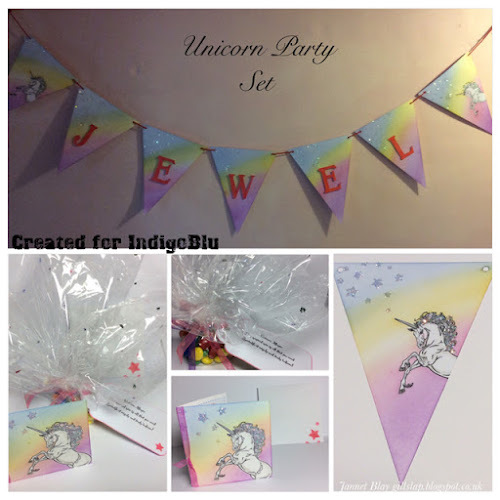 With this in mind I decided to make a Unicorn Party Set. Consisting of Bunting, A Bag of Unicorn Magic, and the all important Invitation Card. 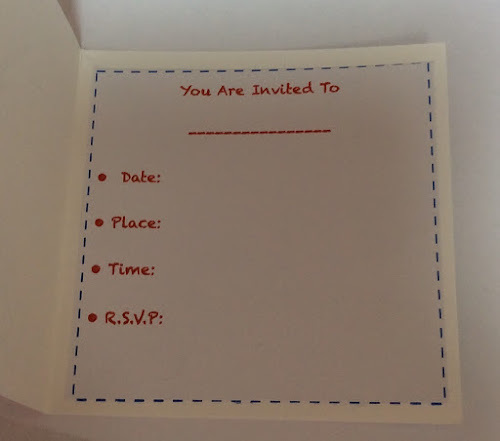 It is a simple design and really easy to make. 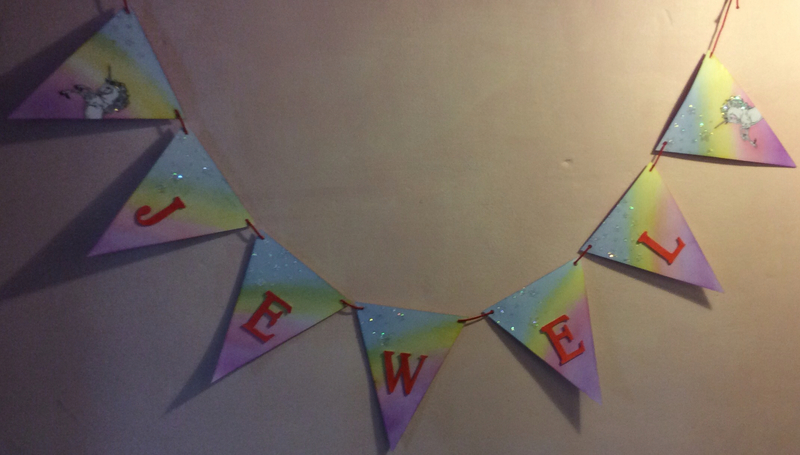 You can add a name age or any greeting you like to the bunting. 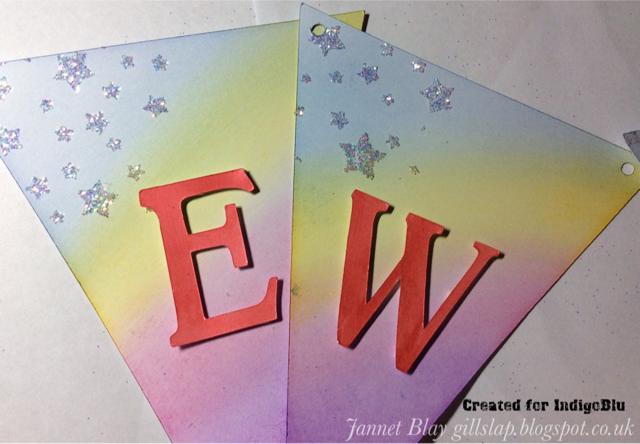 When you have decided what size and how many flags you will need, draw a triangle and cut around it. This flag can then be used as a template to trace around for further flags. You will need to punch a hole in the top corners of each flag. 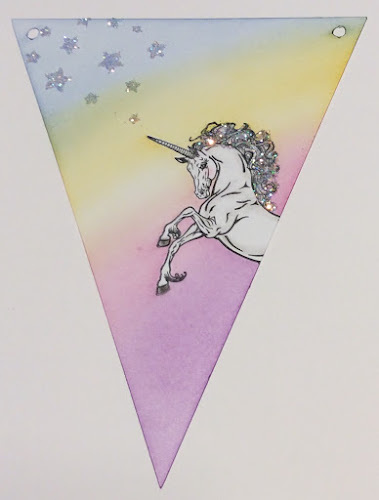 I stamped the Unicorn on the first and last flag.I started by creating a mask for Jewel I stamped him on masking paper, or you could use a large post-it note instead. I carefully cut around him. 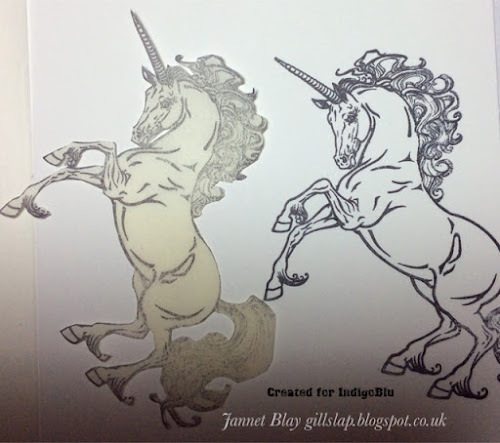 I then stamped Jewel onto one of the flags, I only stamped his top half, then I laid the mask over the stamped image, it's a good idea to take your time doing this, and match it up as best as you can. When Jewel was nicely masked I started creating a rainbow. I swept stonewashed ink diagonally on the left top corner of the flag. I used a brush, but you could use a make up sponge, or an ink blender tool. I followed it by Sunshine Yellow which I slightly overlapped with the blue to create a little green, then a sweep of Raspberry, and lastly a sweep of Purple Twilight. I followed this same sequence on the remainder of the flags. 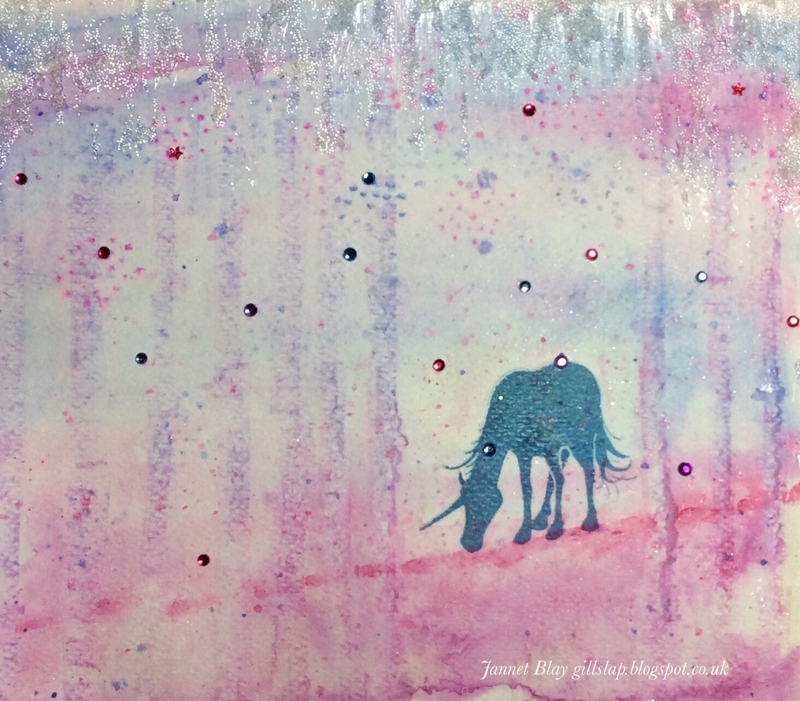 After removing the mask I added a little colour to Jewel, of course he needed some Unicorn sparkles, so I put some slap it on on his mane and sprinkled generously with Unicorn Sparkles. I used the wonderful stars stencil on the top part of the flags and secured it with low tac tape to stop it from moving around. I used a spatula to sweep some slap it on into the stencil. I carefully removed the stencil and sprinkled over the Unicorn Sparkles. 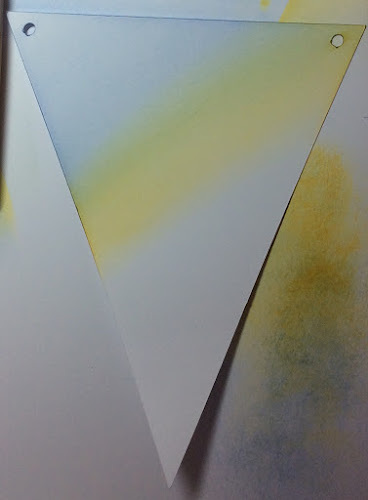 Remember to Wash the stencil afterwards, before the glue sets. I die cut Jewels name, but you could use stamps, or stickers to create the name of your choice. I wanted the banner to be colourful and cheerful so I painted the letters in Ruby Slippers Metallic Paint, and used 3D sticky pads to stick each one of them to a flag. I finished by threading the flags onto some lovely red cord, and hung it up. I used M&Ms as my "magic mix" but any colourful sweets would be good. 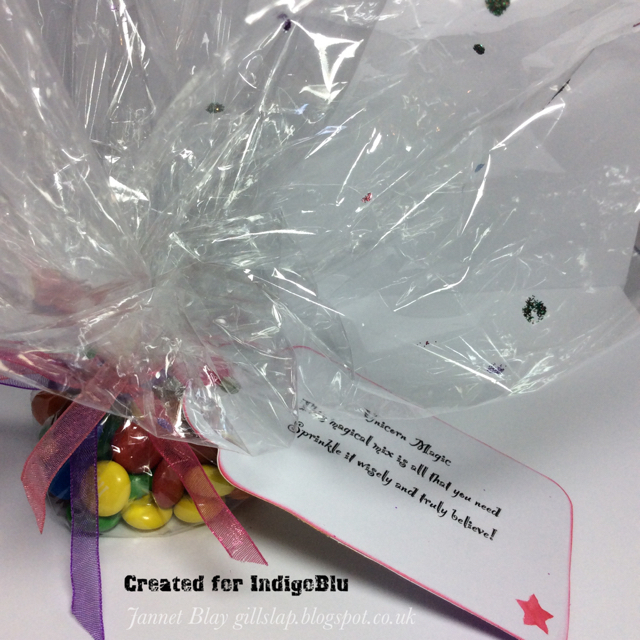 I placed them in cellophane and gathered it up around the sweets, and secured it with an elastic band. 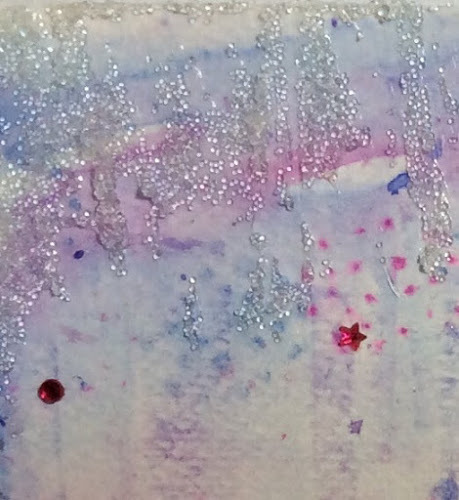 I used stickles glitter to add little dots of glitter to the cellophane. I finished by adding several colours of organza ribbons around the package and tied on the tag. Follow the same steps for the flag bunting to create the rainbow, and the Unicorn and stars for the front of the card. 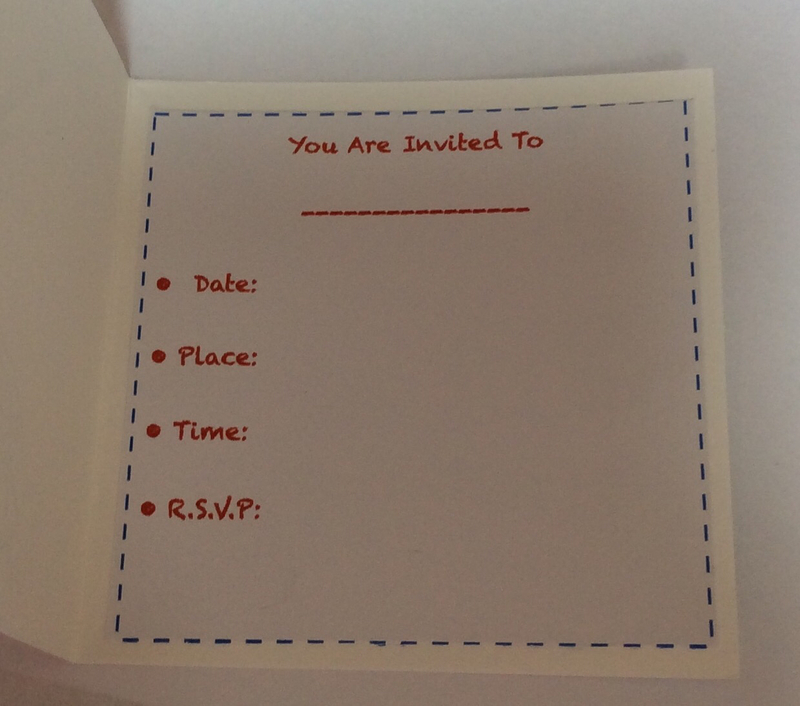 I typed up the invitation and adhered it to the inside of the card. A few stars on the envelope, let the lucky recipient know that there was something very exciting inside! Thank you so much for looking, and happy Unicorn Parties!